We have a fully licensed Restaurant and bar on the premises. We offer a 10% discount for stays over 5 nights in our self catering apartment! We are situated in Wigtown in one of the most beautiful parts of Scotland overlooking Wigtown Bay by the Solway Firth in Galloway, Southwest Scotland. To the south are the gently rolling hills and beaches and rugged cliffs of the 'Machars'. To our North is the magnificent Galloway Forest Park with it's 300 square miles of forests, lochs and hills. Wigtown a lively little town is Scotland's National Book Town and has over 20 book shops and related businesses. The Hotel has magnificent views as it overlooks Wigtown Bay - Britain's largest Local Nature Reserve and is a haven for wildfowl. We have both overnight or short break accommodation available as well as a self catering apartment with kitchen and living area. All our rooms have en-suite facilities. As well as comfortable accommodation there is a fully licensed restaurant (The Bistro). A newly refurbished residents lounge is now available with magnificent views over Wigtown Bay with TV, video and DVD player. We also stock a plentiful selection of books and being part of Wigtown, Scotland's National Book Town, we also have a large selection of books for guests to browse or buy. In the Hotel grounds lies our nursery with a vast selection of shrubs and plants available to purchase. Plenty to see and do.. Fishing, bird watching, hiking, cycling, golf, beaches, historical sites and more are all close by. 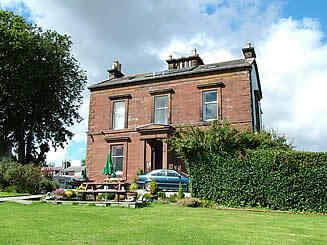 The Hotel is an ideal base for exploring this beautiful, quiet and unspoilt corner of Scotland.